Guy Darrough is a self-taught and highly accomplished fossil collector, fossil preparation expert, and illustrator who has worked in paleontology and related areas for 40 years. 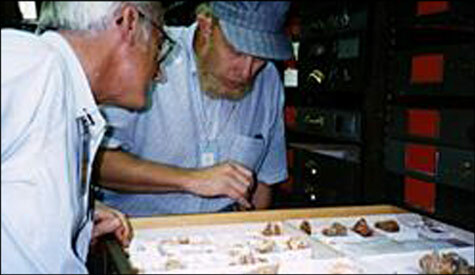 He has collected and studied fossils in Canada, Morocco, and many parts of the United States. Guy's accomplishments include a premiere collection of Missouri fossils, and making significant discoveries in paleontology. At the Smithsonian Institution, paleontologist John Pojeta, looks over a collection of undescribed fossil animals that Guy discovered in the Missouri Ozarks. A list of Guy Darrough's contributions to paleontology can be found HERE. One of Guy's interests is creating life size dinosaur models. This is an Allosaurus, a Jurassic dinosaur that will debut in an exhibit at McKee Botanical Gardens in Vero Beach, Florida this February 2015. 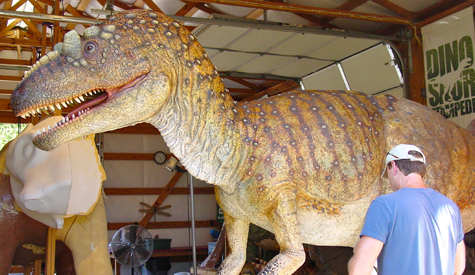 It is being painted by renown Paleo artist Shane Foulkes, at Lost World Studios. 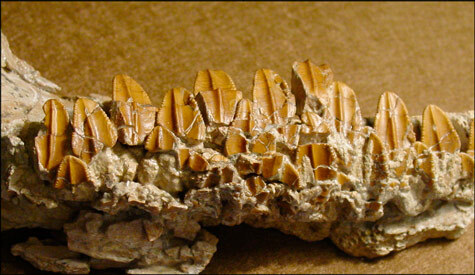 This is a portion of the jaw of Hypsibema missouriense. Guy directs the excavations at the Chronister dinosaur site in southern Missouri. The most recent find is a portion of the jaw from the dinosaur Hypsibema missouriense, a hadrosaur or duck-billed dinosaur. 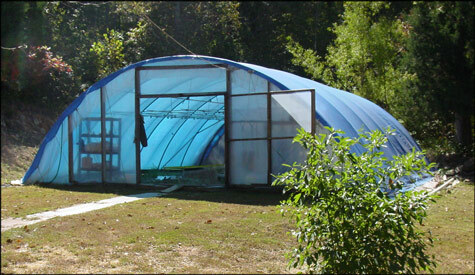 To keep our excavation site from becoming a pond, it is covered with a greenhouse. Notice the hanging grid system that allows us to do accurate mapping of the fossils. This is a cluster of Monoplacophorans that were originally encased in hard rock. Many hours of careful preparation work was needed to expose the specimens. Found in Washington County, MO. The fossils of Monoplacophorans are commonly found in the Cambrian and Ordovician rocks of Missouri. This particular monoplacophoran is a new species as indicated by the robust undulations on the shell. 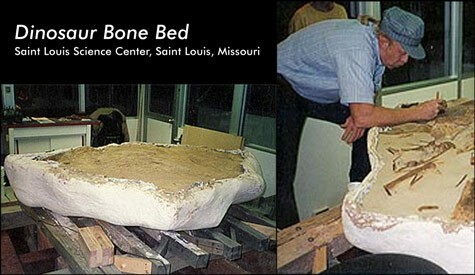 A mysterious slab of sandstone arrives at the St. Louis Science Center. Excavated in Lance Creek, Wyoming, this 2-ton sandstone slab is thought to be a portion of an ancient riverbed and could contain the remains of dinosaurs. Are there really dinosaur bones in there? Guy brought this specimen to the St. Louis Science Center where he prepared the fossils for exhibit. Halfway through the project it is apparent that this boulder is rich in dinosaur remains. Fossil leaves, seeds and small logs begin to show up. Upon completion, a dramatic cross section of prehistoric life has emerged. 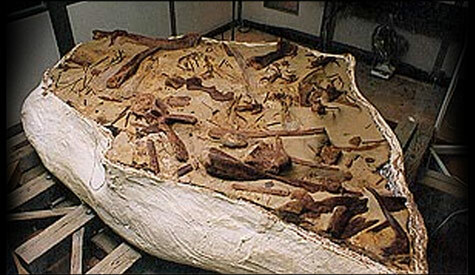 This specimen was found to contain over 200 bones of dinosaurs, turtles, and fish. Visitors viewed the entire preparation process which took 3 months. This specimen resides in Guy's private collection. Do you see a dinosaur skull in this rock? Guy did. In this picture you see a large boulder containing the skull of the dinosaur, Triceratops, at the St. Louis Science Center, "Chip Off the Old Rock" exhibit. He carefully chipped off the old rock and revealed a portion of a Triceratops skull. Part way through the project the shield and eye sockets are exposed. 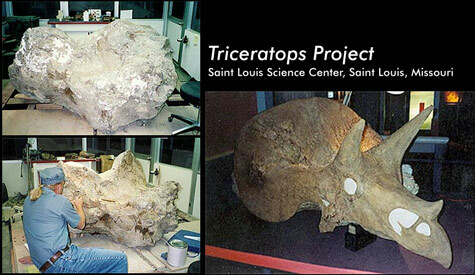 Triceratops lived 65 million years ago in the area we now know as Lance Creek, Wyoming. The finished skull is on display at the St. Louis Science Center. While studying Lower Ordovician fossils, Guy discovered a large chert boulder in Meramec State Park, which contains important fossils. Arrangements were made to provide a spectacular exhibit for the park's Visitor Center. The specimen was found in a hard to reach area of the park, and a helicopter was called in to airlift the boulder off the wooded hillside. By using a small hammer and chisel, the outer crust is carefully removed. Animals that have been encased in rock for millions of years come to light. Chert is very brittle, a wrong move could shatter the rare specimens. 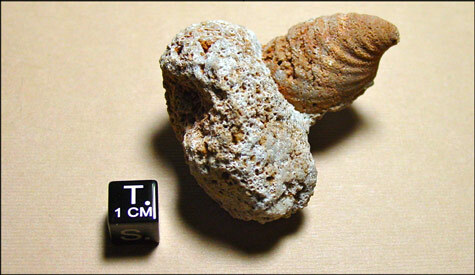 After much work, large gastropods and previously unknown marine fossils are exposed. Each fossil is left in place on the boulder, just as they were when they were buried. 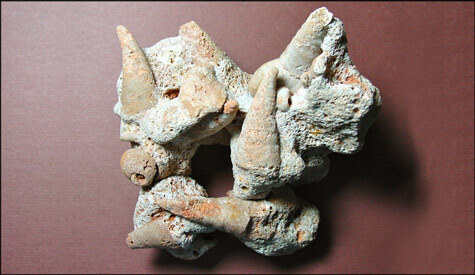 On display, the boulder is encrusted with rare and unusual fossils. 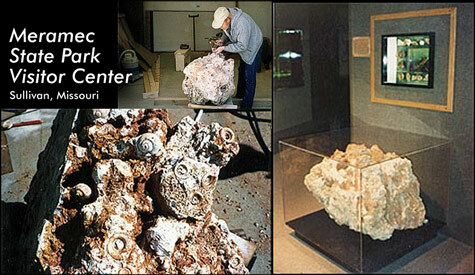 It provides visitors with an interesting look at life in the area over 450 million years ago. Lost World Studios has developed the concept of combining life-like models of prehistoric animals with actual living plants. This combination allows the visitor to glimpse the the prehistoric world first hand and then take home an awesome photo.